Find hotel near House Of Stories Paul Reg .. This museum was opened in 2009 to exhibit the works of artist Paula Rego, a Portuguese painter. She has donated about 600 works to the building, including paintings, drawings and engravings. Her work was always highly related to contemporary issues, and this is reflected in the design of the building that houses the museum – itself an architectural accomplishment. 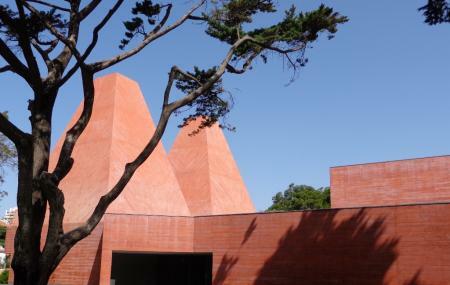 Made of red brick, and of Cascais’ own grey marble, the four wings of the building create a striking contrast with the green grass of the surrounding garden, and the blue sky. It’s unusually shaped towers have received much attention from critics and visitors alike. Ask a local for public transport options. Rent a car or drive a taxi. How popular is House Of Stories Paul Rego Or Casa Das Historias Paula Rego? People normally club together Boca Do Inferno and Cascais Old Town while planning their visit to House Of Stories Paul Rego Or Casa Das Historias Paula Rego. A wonderful space, exhibiting the works of Portugal's greatest living artist. The entry fee of €5 per person is spectacular value for money, and the adjoining cafe/restaurant is well worth a visit. Pro tip: have a bite to eat in the cafe before you stroll around the expansive exhibition. A well-fed body leads to an open mind. Nice, architecturally interesting building. Entrance- 5€ for the exhibition. There is a nice cafe inside with good prices. Great place to visit if you are passing by! The architecture is very peculiar to match a very unique experience while visiting.